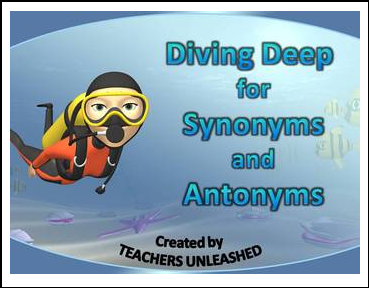 Free download of our 21 slide PowerPoint presentation will take your students to the majestic ocean as they explore understanding synonyms and antonyms. The presentation gives a description of what synonyms and antonyms are, and gives several practice slides for students to create T-charts, and interact with the PowerPoint using whiteboards or paper. At the end of the presentation, there are four slides for students to practice test-prep questions. With exemplary graphics and animation, your students will be captivated and engaged! Free to download and add to your collection!